On my fridge is a whiteboard listing all the textile projects I want to complete in any given year. The projects are wiped off as they are finished, but the board keeps filling as I have new ideas. Projects are usually added wherever there is space, but I also take the board down every now and then to reassess priorities and write it all out again. Once a year this happens at a particular time, and that, of course, is the new year. So in the last week or two it's been wiped clean and written afresh. 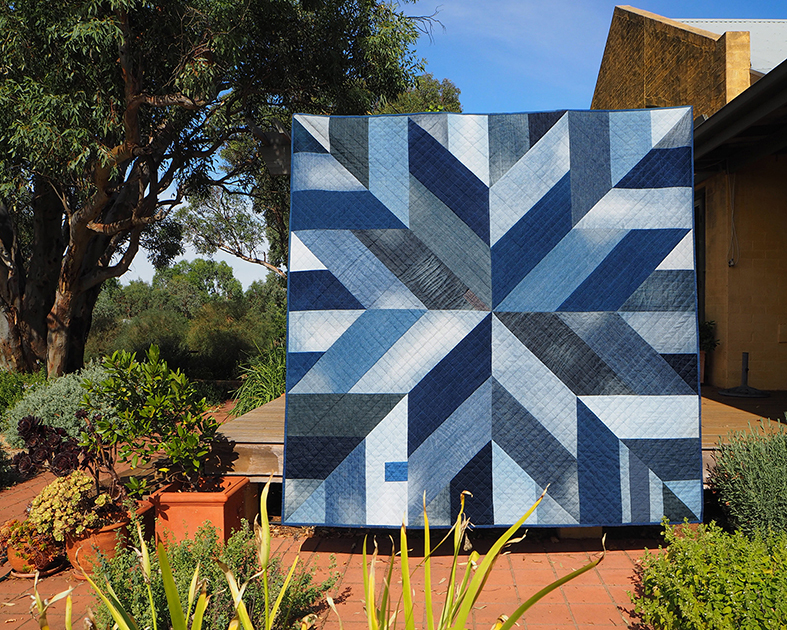 This was the month I finished the Blue Giant quilt. I got a bit smarter with this pattern release. I took better pictures, posted them on my Craftsy and Etsy shops and then linked them all through a couple of my boards on Pinterest. On Craftsy I also added it as a recent project. A while later Craftsy picked it up somewhere along the line and also pinned the images to a few of their boards. It's now been repinned thousands of times and still sells copies on an almost daily basis. So to Craftsy I'm forever grateful! In February I started my ongoing jean pocket project. I had a bunch of leftover pocket areas from making the Blue Giant quilt and wanted to do something with them. As you'd know if you've visited here before, I'm concerned about the sustainability of the textile industry and I thought this project might highlight the wasteful nature of our current fashion consumption by contrasting it with the amount of time it actually takes to make things by hand, which let's face it, our clothes are, even if they're mostly not our hands. To see the rest of the pockets done so far, head over to my Instagram feed. For the last few years I've been juggling textiles with contract work which means I don't have a regular income. When Ace Camps released their new trips for the year, I figured I'd travelled last year and so I shouldn't spend money heading off again in 2017. Then I thought about it a bit more and realised it was 2015 when I'd last been away. I was also waiting for a contract to start up and decided there was no better way to pass the time – so off to Swaziland I went! 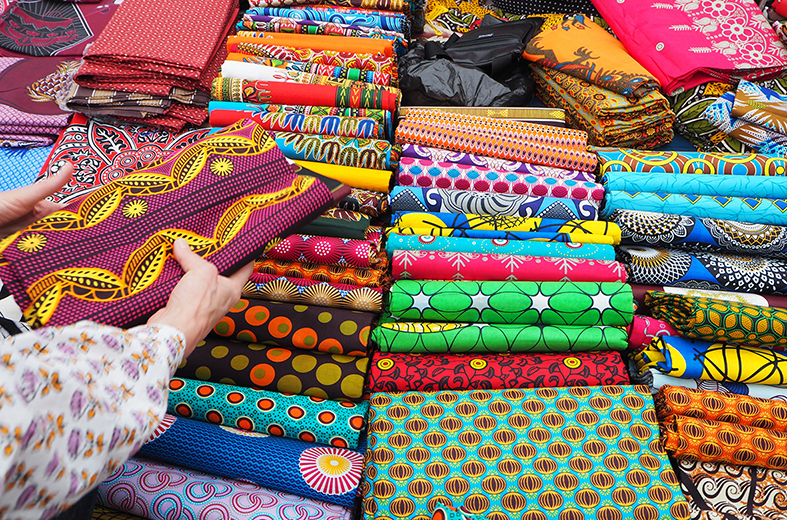 I'm so glad I did – it was such a great little trip, the highlight being our three days spent at Baobab Batik. You can read more about that here. 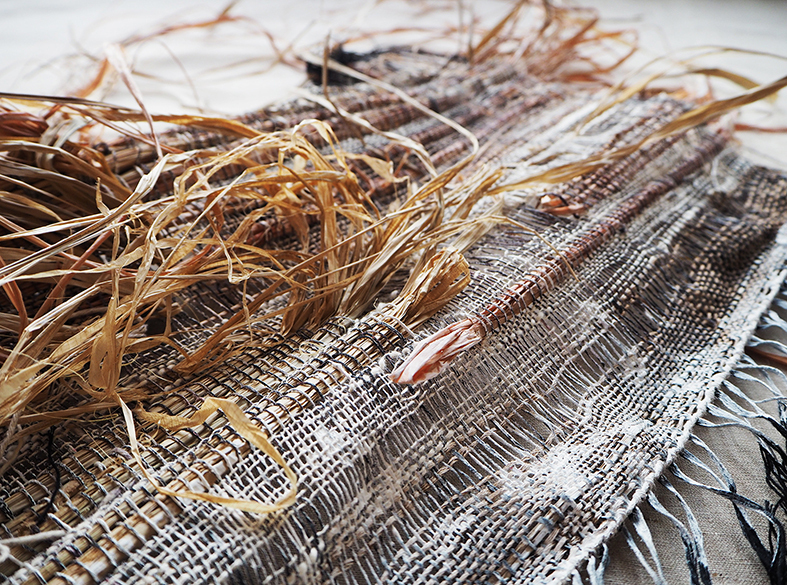 In April I got serious about the last works I needed to submit for Seasonal Stories – a community exhibition that was part of the Wangaratta Textile Festival. May was largely spent in Melbourne catching up with family and textile folk. Progress was made on many projects, but in particular, we began preparation in earnest for Tenfold Textile Collective's next exhibition. We photographed works and then over subsequent months, wrote applications and submitted them, which resulted in our acceptance at Backspace Gallery, Ballarat with a show planned for April this year. So excited to be exhibiting with this group again! This month I nailed a sizeable work contract, so to celebrate I rented myself a studio! While this hasn't seen the textiles disappear from my apartment entirely (the knitting stays at home), and I do have times where the thing I need, to do whatever project I'm working on happens to be in the wrong location, it is an absolute joy to leave projects all over the floor, couch etc in the studio, shut the door on it, and not have to step over the mess in my working/personal life. Plus the light is divine! This is the tidiest the studio has ever been – in preparation for Inner West Studios' first birthday. Oh how I miss my Melbourne textile gals! In July I got to spend a weekend with some of them at the Wangaratta Textile Festival. We talked, we walked, we ate, we planned and we gorged ourselves on textiles. The Wangaratta Textile Show itself was everything you'd hope for in a modern textile award – a mix of emerging, mid-career and established artists; a wide range of techniques and styles represented; concepts ranging from whimsy to deeply thought-provoking and craftsmanship at the level of mastery. In September 'What's your time worth?' the quilt I created for our last Tenfold Textile Collective show was exhibited as part of Art Quilt Australia 2017. Having not had the opportunity to see a show dedicated to art quilts, I took myself down to Launceston to check it out. The show didn't disappoint. It was so refreshing to see some really interesting and different works and know that this type of work is actually being done in Australia. This month wasn't about me, but about the Dior show at the NGV. 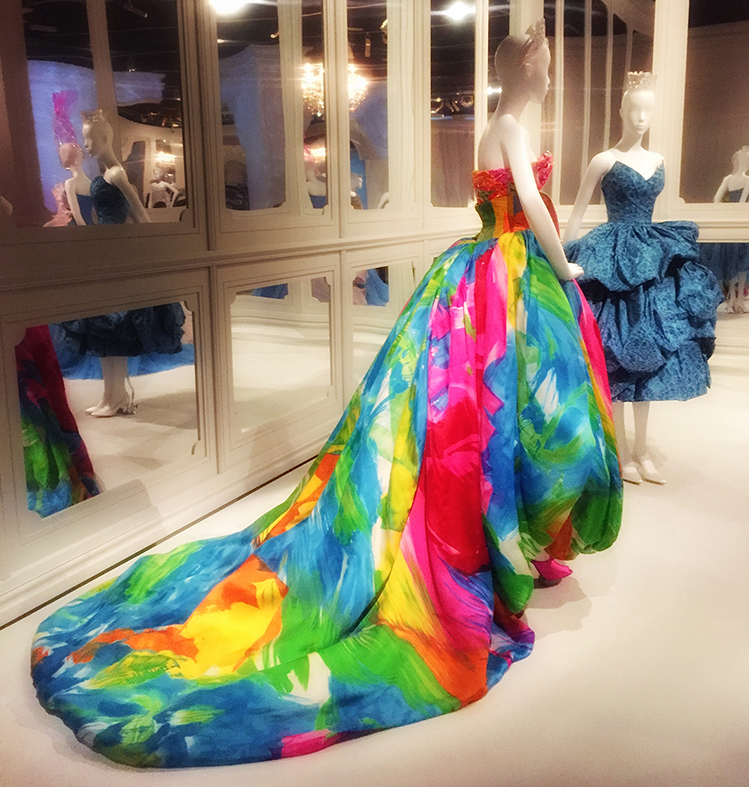 While the Galliano numbers were the showstoppers in terms of wow factor and photo-worthiness, the real art and craftsmanship all belonged to Dior. The early wool suits were truly sublime. Yep, that was one of those Galliano numbers! 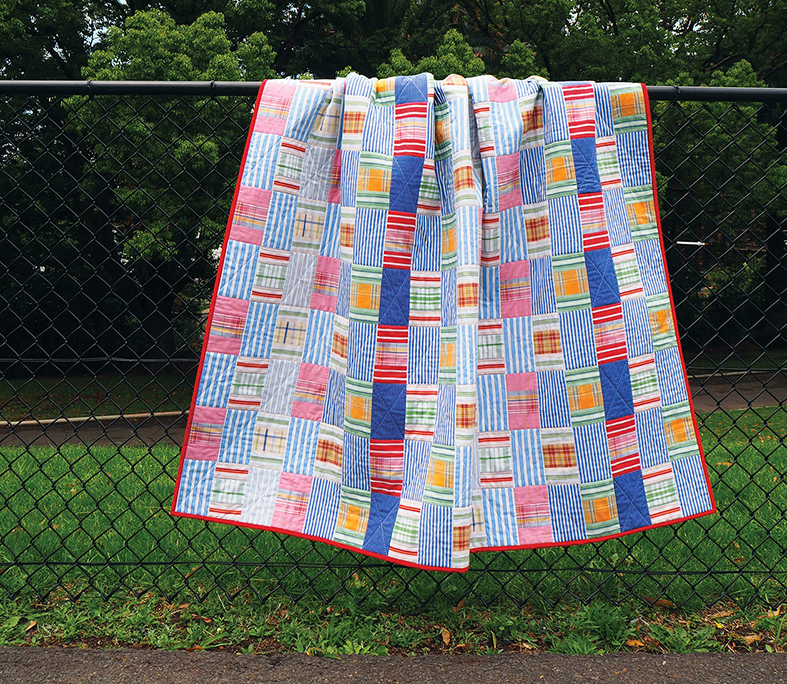 My Strip Weave quilt pattern was released in November. It was inspired by the Kente cloths I discovered while researching African textiles prior to my Swaziland trip, but this one is made from upcycled business shirts. It's a very flexible pattern that you can really experiment with, so I still have ideas for more versions that you'll no doubt see over the coming year or so. 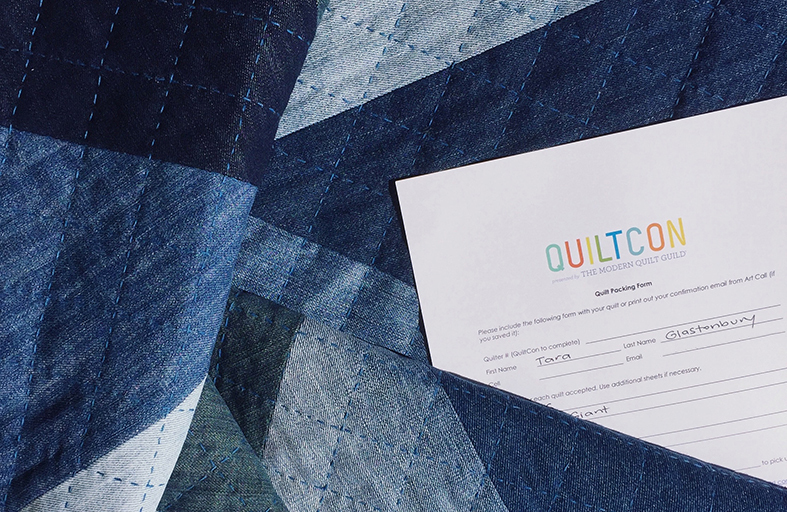 In December I came full circle with the news that the Blue Giant quilt had been chosen to hang at Quiltcon. It's a real thrill, so after a work deadline shifted and a lot of deliberation and advice-seeking, I've decided to follow it and 'What's your time worth?' over there to check out the show. It's a ridiculously short trip I'm making, but you only live once! Any advice on how to make the most of things while I'm over there is gratefully received. So that was 2017. I'm so glad I wrote it all out like this. By December I'm looking back at the year feeling like I didn't achieve or do much, but when I write it all down it makes me thankful for how far I've come, the people I've met on the way, the ones who share the textile journey with me the fact I get the opportunity to spend a good amount of my time doing something I love. Happy 2018 everyone! I hope yours is full of exciting textile plans too. What an exciting year. Your work is beautiful. Thanks for sharing your talent. Thanks very much Barbara. It's been a motivating experience heading into 2018. Looks like you have set yourself a pretty impressive list of goals for the year!